This weekend is the New Zealand FIRST LEGO League Championships. There are 34 teams coming from around New Zealand. Team Antimatter were very slow off the mark this year. Six weeks before the event there was a scramble and it was decided that Team Antimatter should get organised and field a team. Ethan has now retired from Team Antimatter along with Amy who is going to pursue her New Zealand Netball career (or maybe technical adviser to Team Antimatter!). So, the members of Team Antimatter are: Tim, Harry, Molly, Jaime and Ann. This years theme is rubbish and recycling. FIRST LEGO League Trash Trek! Team Antimatter have been looking at better ways to dispose of food waste. Below are some photos from our season so far. Make sure you come to ACG Strathallan, Hayfield Way on the 3rd of September. The competition is happening all day with the robot runs happening in the afternoon. The New Zealand FLL 2015 Championship is on this weekend and Team Antimatter are going to be there with Twirly Whirlys! Come on down to ACG Strathallan at Karaka and cheer for the robots. We would love to see you there! What an event! The Asia Pacific Invitational FLL (FIRST LEGO League) competition has come to end. Packing up the pit was very sad. We had a ball in Sydney. Team Antimatter didn’t pick up any awards this time. Congratulations to all the teams who won awards. You can find the awards results here when they are published. There were some amazing robots. Perfect scores of 858 were scored by two teams. Wow! The friendship night was also incredible. 24 teams from around the world showed a huge variety of culture. It was a very special night to see so much talent in one place. From the drums of South Korea to the Chinese dancing to the South American teams with their dancing it was all very exciting. Team Antimatter would like to thank Macquarie University, FIRST Australia and all the volunteers for giving up their time and making the Invitational such a great event. We hope to see you in the future! In the 2014 season Team Antimatter achieved runner up team in the New Zealand Championship. This meant we were invited to attend the Asia Pacific open Championship in Sydney, Australia. As usual the robot is never finished. Hopefully it will work on the day! The Asia Pacific Championship is held over 3 days from the 10th to the 12th of July. Macquarie University are hosting the event. There are more than 40 teams from all over the world attending. Teams are coming from as far away as Norway, Italy, Mexico and Turkey. It should be a great event. We even have Twirly Whirlys to give away. If you are not doing anything this weekend and are in Sydney, come on down to Macquarie university and cheer on the teams! Don't forget to follow us on Twitter for updates! You place the Band on your wrist and when you get too loud the microphone will sense this and the band will vibrate reminding you that you are being too loud. We talked to Judith Fromont about our solution, she is a teacher at St Joseph’s school. We asked her about noisy classrooms and she asked us some questions about our solution. She loved the idea of our solution. Well. It has been a while since there was any action on the website. The team has been busy once a week though. We have managed to get a solution together. We have yet to visit an expert but we have found one. There is not enough time in the week! The robot is coming along. There are some tricky missions this year but with extra brain power this in the form of James, Amy and Harry the robot building is flying along at full speed. The robot will never be finished but that is life in FLL. Here are some photos from today. For those that aren't scared yet there are only 6 weeks to go until the New Zealand champs. Arrgh! Well. It all starts again! The 2014 season is upon us. Team Antimatter has doubled in size this year and we welcome James, Amy and Harry to the team. We also did some good work on our project and even got a research question sorted! Next up. Build the challenge set! Before we left for the World Festival in St Louis, Team Antimatter thought it would be cool to put a GoPro on Eruptor. So, after some experimenting we managed to get it going. Here is the result! In hindsight we should have shot behind the robot too as stuff happens behind the robot (such as picking up the truck and knocking over the building) but it was a cool result. Sorry about the lighting. It was dark outside so lighting wasn't the best. Thanks to Darryn for lending us the GoPro! Hello robot fans. Here is the official Wrap Video for the 2014 FIRST St Louis event. No sign of Team Antimatter in the video. We can't have done enough dancing! Next up was the robot game. What an atmosphere! Amazing. There was so much noise and music and yelling. The robot performed great. The robot didn’t achieve our perfect score but was still very reliable. We placed an awesome 13th out of 80 teams. There wasn’t much time for celebrating as we were back to the pits to be interviewed by https://www.youtube.com/user/LEGOClubTV. There was barely time to dismantle our pit and we were off to the Ball game. The Baseball was held at Busch Stadium which is home to the St Louis Cardinals. All the FIRST robotics teams got to complete a parade around the field. The New Zealand flag was flying high! Luckily the Cardinals won. Go Cards! Here are some pics of Day 1 and 2 from the World Festival. The selection is a bit thin as there are cameras scattered all over the place. More photos to follow! Wow! What an amazing round! First festival is underway. Chaos reigns. Here is pit set up underway! We forgot to take a photo at the end of the day with the pits all set up. Off to opening ceremony shortly! on the FLL/Einstein stream. The judging will probably not be streamed but the robot games should be. From Team Antimatter who are about to get on a plane! This BLOG post was posted on Geekzone by Coach Matt. I have been meaning to write this post for a while but the time just flies by! FIRST (For Inspiration and Recognition of Science and Technology) was founded by Dean Kamen of DEKA Research. You may recognize his name. He invented the Segway (among other things). He is an amazing guy. Dr Charles Elachi is a space explorer who led the recent mission to Mars with a rover called Curiosity. He is the director of NASA's Jet Propostion Lab. Tim and Ethan went to his lecture. We came home buzzing and trying to figure out how to get a submarine through the ice layer of Europa (moon to Jupiter). Thanks Dr Elachi for an awesome lecture! Here is our Kickstarter Video! On Sunday we did a video shoot for our Kickstarter campaign. It was only supposed to take a little while but it took ages! We liked the lighting director the most. He was very calm. Anyway the video turned out OK. Keep an eye out for it soon! On Saturday the 5th of September ACG Strathallan hosted the 7th annual New Zealand FIRST LEGO League championship. Due to the way the New Zealand school year runs KiwiFIRST elected to change the way the FIRST LEGO League season is run. This year was a repeat of the FLL WORLD Class so we had another chance to have a go at this challenge. Some of Team Antimatter have moved on (to bigger things, mostly robots!) so we said farewell to James, Tonii and Amy. The rest of the team thought we needed some new recruits. So, we asked around and Molly, Ann and Jamie are our newest team members! And we must say, they are very cute and enthusiastic. The championship was a great day as usual. There was dancing, some awesome robots and lots of cheering. The Referees (a team not the actual referees) went to the FIRST LEGO League World Festival in St Louis this year and they had done a lot of work on their robot. It was an amazing robot and won the robot competition by more than 100 points. It was great to watch their robot at work. Team Antimatter had Twirly Whirlys and we had a great time with our new members presenting our Buzzy Band project and running the robot. Team Antimatter we also crowned the New Zealand champions for 2015 which was an amazing achievement. We have another trophy! Thanks to all the teams who attended the New Zealand champs. We all had a great time. See you in 2016 for FLL Trash Trek! Team Antimatter have new members! As New Zealand is repeating FLL World Class this year (due to the New Zealand school year inteferring with the global FLL season) the youngest members of Team Antimatter wanted to have a go at FLL. We would like to welcome Ann, Jaime and Molly to Team Antimatter! Good luck on Saturday. We are sure you will have a great time. We are having a ball in Sydney! Our last run is about to go! Wow! What a day. It had to be takeaways for dinner as everyone was tuckered out! This year 27 teams competed in the 6th New Zealand First Lego League Championships. They came from all over New Zealand. The atmosphere was electric. The music was pounding, there was dancing and chocolate and robots.... The Referees were crowned the New Zealand Champions (well not the actual referees, there was a team named the Referees which got confusing when the MC's asked whether the Referees were ready!). They had an awesome robot and it was great to watch. Team Antimatter were crowned runner-up Champions and had a great day. There were a bunch of Twirly Whirlys given away in the Lego build competition and chocolate. Well done to all the teams who competed. May your robots drive straight in 2015. See you there! The speech. Luckily we didn't post the youtube video of us singing! The view from above. That scoring job looks intense! On 29 of November ACG Strathallan Karaka will host the 6th Annual FIRST LEGO League New Zealand Championship. 28 teams of children from around New Zealand will compete in a LEGO Mindstorms robotics competition designed to inspire and excite students about science and technology. Each year the competition theme changes and teams must research a real world problem based on the topic. This year’s topic is “WORLD CLASS” where teams must investigate how students will learn in the future. FIRST LEGO League (FLL) is an international program for 9 to 16 year-old children (9 to 14 in the U.S. and Canada) created in a partnership between FIRST and The LEGO Group in 1998 to get children excited about science and technology – and teach them valuable employment and life skills. Children work alongside adult mentors to design, build, and program autonomous robots and create an innovative solution to a problem as part of their research project. The competition season culminates at high-energy, sports-like tournaments. Like any other organized “sport,” teams also fundraise, create a team identity, and go on field trips. FIRST was founded in 1989 by Dean Kamen (inventor of the Segway). The FIRST mission is to inspire young people to be science and technology leaders, by engaging them in exciting mentor-based programs that build science, engineering and technology skills, that inspire innovation, and that foster well-rounded life capabilities including self-confidence, communication, and leadership. Time: Robot competition rounds from 12 to 3 pm. Open to the public at no charge. Teams: 28 teams from around New Zealand including participants aged 9 to 16 years. 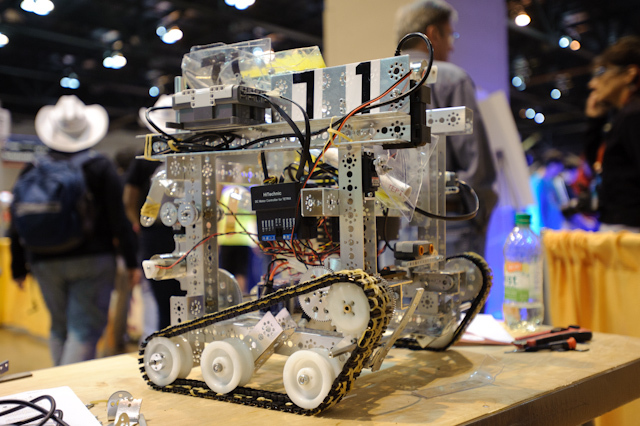 I have blogged before about the FIRST family of robotics program for students. The New Zealand Annual FTC competition is being held on Saturday at ACG Strathallan. The finals happen between 1 pm and 3 pm although the competition will be running all day. Entry is free so come along and see some cool robots competing. FTC (First Tech Challenge) is a robotics program for years 7 to 12 and bridges the gap between First Lego League using lego robots and FRC with big robots. FTC uses metal components and focuses on engineering and programming skills. Robofest is a robot competition for Christchurch school children in years 5 to 8. It is a one day competition held at Russley School. As a more casual competition than First Lego League (which can be pretty full on!) it is a great opportunity for kids new to robotics to come along and get involved. Team Antimatter will be there with their World Festival robot and will be giving demos of the 2013 FLL Natures Fury challenge. We may even have some Twirly Whirlys to give away. So! Grab a robot and some keen kids and we will see you there! Wow! What a few days! In the aftermath of the FIRST World Festival there have been a distinct lack of Team Antimatter updates! This post will hopefully fill in some of the gaps. The closing ceremony was a great celebration with everyone receiving a medal and Team Invictus from the UK being crowned overall champions. Although Team Antimatter didn’t pick up one of the awards they put in a great performance and the Rubrics were outstanding. After the awards we were back to the hotel for a bit of a break and then on to watch the FRC finals. This was in the dome and once again the atmosphere was incredible. It was very exciting to watch the big robots shooting huge balls around the playing area. In FTC and FRC all matches are run as alliances. This means team work with another team is vital. After the final match and a performance by Will.I.Am it was off to the finale celebration. There was a glow party, food and carnival games. It was an amazing end to a great event. There were some amazing teams at the FLL World Festival. The loudest were Team Red from South Korea who started with an amazing performance at the opening ceremony and didn’t stop for the whole event. We thought we had the brightest shirts at the event but the Hippie Panda’s beat us with their tie dyed shirts. As part of World Festival teams are invited to complete passport activities. Team Antimatter decided to teach e papa waiari which is a traditional New Zealand Maori stick game to other teams. Here is team Slovenia! Well. Judging and practice day is finished. What a huge day. We seemed to spend most of the day out of the pits. That was a shame as it was an awesome party going on at that end of the dome! We had great practice runs with the robot and also had great judging sessions. Tomorrow is robot game day. Hopefully we will spend more time in the pits. If you are in St Louis come down to our pit and get some twirly whirlys! We still have some left. Good luck to everyone tomorrow. May your robot drive straight! We have to be up early as we are on the weather channel. Look out for us! Well. We made it. Some of the team took 31 hours as Ethan wanted to visit Sydney airport on the way. For the rest of the team it took 19 hours. Yesterday we visited the St Louis Arch. Wow! It was amazing. We still have a couple of days before the real competiton begins. Bring it on! Team Antimatter have twirly whirlys! We have some awesome Team Antimatter twirly whirlys to give away at the World Festival. Track us down in the pits to secure yours! Keep an eye out on the website for the secret password! Hi Everyone. There are now less than two weeks to go until we leave for the FIRST festival. We have been working hard on the robot and our three presentations we will give at the festival. We are also now on Twitter so you can follow us at https://twitter.com/TeamAntimatter. @teamantimatter. It should be the quickest way to catch up with our journey. Thanks! Tim, Ethan and Tonii. Hi Everyone! Our Kickstarter champaign is Live! Please share it with the world! Thanks, Tim, Ethan and Tonii! Team Antimatter is a group of three 9-11 year olds from Pukekohe, Auckland, New Zealand. Ethan, Tim and Tonii recently competed in the New Zealand First Lego League competition in New Zealand. We won this competition and have been invited to attend the World First Festival in St Louis, USA in April 2014. FLL has a huge following around the world with over 20,000 teams and over 100,000 participating children aged 9 to 16. The teams must build and program an autonomous lego robot and also solve a real world problem through research and implement an innovative solution. Antimatter focused research on Mt Ruapehu and the threat of an eruption. We designed a concept app that alerts Ruapehu users of an impending eruption and guides them to a safe zone on the mountain.